Dealing with DM: a Blessing and a Curse | All Around Dogs Dealing with DM: a Blessing and a Curse | Thoughts on training and life with dogs. In the 7 months since Dash’s diagnosis, a number of friends have lost their dogs with very little time between knowing something is wrong and saying goodbye. The dogs have all been younger than Dash and it breaks my heart that these young, vigorous spirits were lost so quickly. Living with DM is no picnic, but I’ve come to realize that there are some “benefits” to a predictable, progressive disease. They are also the things that make this disease heartbreaking. There is a test and a specific, identifiable first symptom. I knew before I ever took Dash to my general vet what was wrong. I went because I was looking for confirmation and to get as close as possible to “certain.” The test doesn’t tell you that your dog has the disease, but if they come up positive then they are capable of having it. Add that to the toe drag (either one back foot or both) and the chances that it is anything else are tiny. It’ll start with the toe drag. Occasionally “knuckling over” so they are resting the top of their foot on the ground. The technical term is a loss of “proprioception” – knowing where their foot is. If it didn’t start out on both sides, it will be soon. How frequently they slip will rise, how many throw rugs you have around the house will increase. The gear that you have or plan to get will increase – back end harness, booties, a cart – as their mobility slips away. For Dash, his confidence with things like jumping into the car or on to the bed decreased in early Spring. He has started to visibly measure the distance between the furniture he is on and the nearest rug before cautiously jumping down. When he gets excited, he hops from rug to rug, skipping as much bare floor as his silly bouncy will allow. If he forgets himself while he’s excited, he’ll fall. Worse, sometimes his legs come out from under him even though he’s standing quietly on carpet. I don’t know how long I have before the symptoms creep up on us, but I know what lies ahead: He’ll need help staying upright when he goes to the bathroom. He’ll need help getting up or using his back end. When holding up his rear end in a harness is no longer enough, we have a cart. Until then, he gets to pull this cart for fun. Unlike an unknown illness or a disease with many treatment options, you know that nothing you do can stop the disease. You might slow it down, but it is a problem you cannot solve. While I do have a certain amount of uncertainty and guilt about the extra treatments he could be receiving, I know that they would only (possibly) buy me more time. A friend told me that she didn’t expect the time leading up to the end with her elderly dogs to be as special and precious as it was. She described it as “Really hard and really beautiful at the same time.” When I first read that, my thought was that I hadn’t reached that point yet. In mid-June we went to a weight pull practice – depending on their scheduling, it may have been his last. We skipped the drag weights, because he would have tripped, and went straight to pulling a cart. 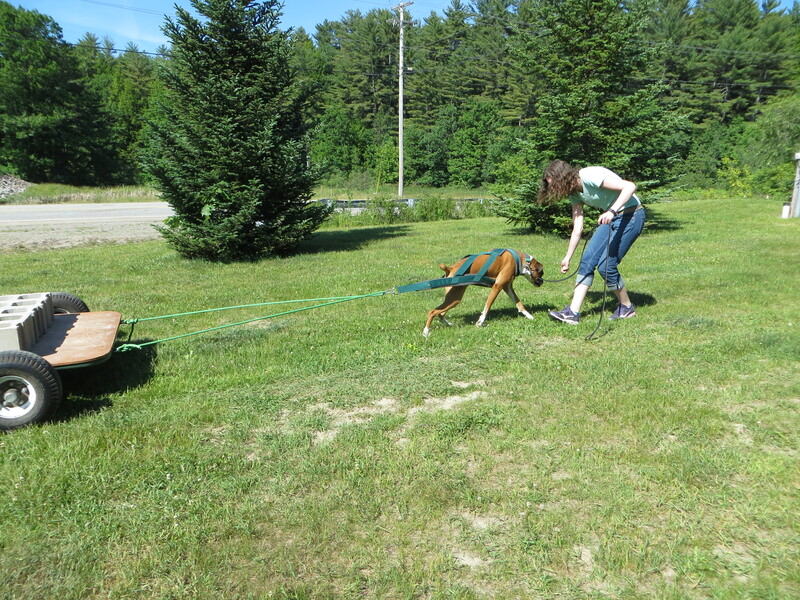 It was a warm gorgeous summer afternoon and we were pulling on the grass in front of the studio. Instead of struggling to get him in and out of the car each round, we just settled into a shady spot nearby to wait for our turns. I was away from the group, just me and my Bubba. It was bittersweet because I couldn’t have been so at ease when he was able-bodied. I couldn’t have dropped the leash and walked 10 feet to the car and trusted that he wouldn’t get up. 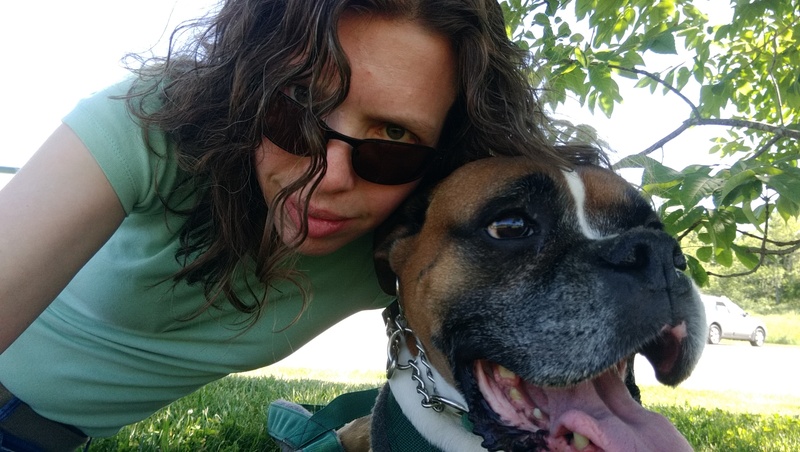 I couldn’t have been so sure that he would just stay in one place and rest with me, that I could tether him to a small branch and he wouldn’t even pull his leash taut. It was beautiful. But that moment, at least, wasn’t hard. Perhaps because I was riding the horse in the direction it was going, enjoying the relaxation that his condition allowed. Pay attention. Play full out. Let it be easy. Takin’ it easy with my boy. I’m here for you, Bubba. I promise that I will try to follow that advice during the rest of my time with you. I will watch you. We will play together. I will do my best to “get easy” with you.